maybe keep this thread just for the Claymore 1 and start seperate threads for other versions? maybe different threads for different boards issues? Schematics online..to save Colin PM'ing them all the time unless he wants to keep it that way? Copyright etc Colin? Annotated photos of the boards for the less tech inclined so we ( I ) can identify parts / test points for fault finding etc. Wiring Pre-out sockets to the two spare back plane holes..where to take the taps from. Setting Bias current. "How to..." needed..
Selector switch...source for a better quality one?..I have had to replace mine twice now in the 25 years I have owned mine. Adding another input. The front wafer switch is a 2pole 6 way, but since only 4 are used..what is required to add another input. 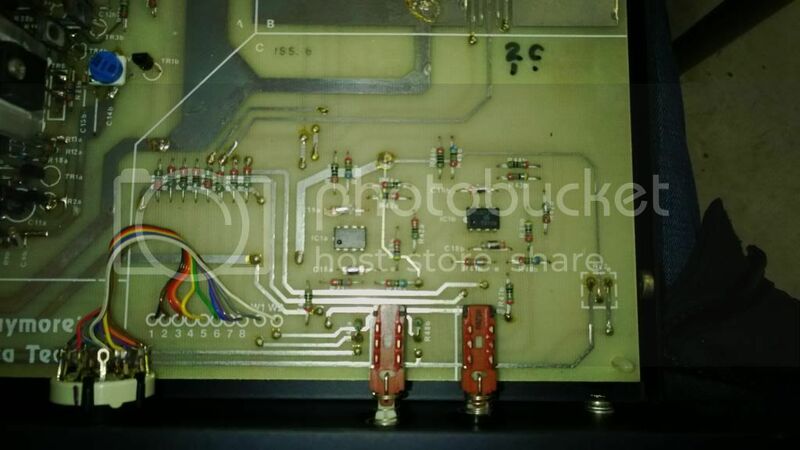 is it just a straight feed from back panel to front selector via a 10kΩ resistor or am I missing something? replacement transformer part numbers etc. If Col is happy for the schematics to appear here, we can host them on this server. Just send them to me and I'll upload them. Colin has very generously let us have the circuit diagrams to the Claymore. What a top chap! I wonder what all those squiggles are? I love things like that. No idea what they mean though. None at all. Having looked through the schematics, I am having difficulty tying them all in to each other, seeing where and how each one relates to each other. I may yet..if I ever find the time, do a complete reverse engineer from the board I have..copying in the schematics Colin has provided when I see how they fit in with each other. Edit : I have a piece of free Windows schematic software ExpressPCB and I was thinking of creating the schematic in that, I looked over the board quickly last night and to be honest it is a bit more than I can do, should not have opened my mouth so soon. Go to the LTC website down load there Sim program easy to use. Setting IQ up you need to do this.The procedure is as follows. CD 10KHz at 200mV approx, volume low insure no DC offset (low) 8 ohm load resistor set output via volume to 2Vpk-pk at that point set IQ preset to S/C position then adjust until visible distortion has gone. but do keep a eye on temp rise. That is the best and quickest way ,now repeat for other channel. Then check volts across IQ pot it maybe has high has 3.6V but this will depend on FETs. If you see any oscillation switch OFF, and investigate. Some FETs need a high value of gate resistor on Hitachi and Toshiba 270R is the norm on others is can be as high as 1KR. I think this could be a bit beyond my capabilities without a bit more hand holding, but only if you have time. I am guessing IQ is short hand for Bias Current? CD 10kHz? oK so 10 khz signal..but in put where ..is CD a point on the board? Distorting on one channel. Other channel fine. Any ideas how I can the hole shabang singing in stereo again....? It sound like one of the FET,s has gone to silicon heaven , to replace is not hard Paul Q is the best lad to do that and I have with luck given him a few bits to help. Both will need to be replaced. But check fuse first. FETs should have got to you now, have they ? mmm 8 days and not there by Post in Jiffy bag. If not there by Sat tell me please. Sorry i can't help more other than say when you replace the selector ry to replace with something better, the standard sort are poor. Since I had my amp in 1987 /88, I think I have replaced that selector three times, those little wafer switches are just ...crap. it is the cheapest switch around for sure , mine is still on its original switch and only started playing up in the last year,given how cheap they are and how easy it is to replace them its not such a huge deal,, i will be using the same type again for now, then, once i have fitted the alps blue velvet pot and tuned the phono stage a little and had all the fets replaced i will have a go at finding a 'better' switch , for now its a case of getting all the worn parts replaced then start work on improving it. English Channel was easy it was the Grand Canyon here in Somerset that was hard, socket good idea. I like the AD797 chips they seem to perform and sound the best in this circuit. how fast were you going? My e-bike is capable of 55 mph ..and it was still pulling at that speed...100volt 140amp 18FET 4110 controller running a Xlyte 5304 in 26 inch wheel. Neil, I was stopped, and a truck came by and the wind from the truck pushed me of into a iron gate, and I got a cracked rib. Yours sound like fun mine only does 35MPH flat out and only when I bypass the hall effect sensor with a magnet. Is this you one here. One of my fun builds, yes....that was capable of 30 mph...scary with that front wheel. as search term...any chance of linbk to your item? I you do start changing chips, once swapped is there any re setup procedure required, or should they just work as direct swap. I am very rusty with regard to all of this...43 now...last time i played with anything like this was my electronics at school and while doing a bit of amateur radio building, probably 20 years ago. 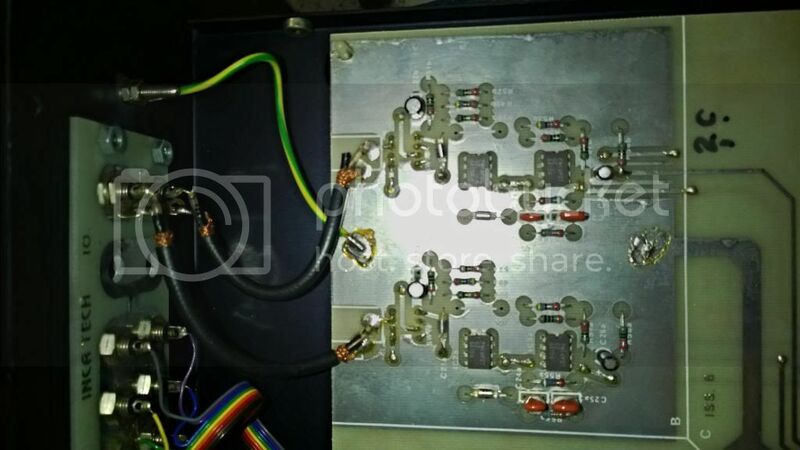 Un-screw the four self tapping screw in the centre of the chassis and it will come out when you remove the circuit board, there is five other screw that hold the PCB in, on later version the Transformer was also fixed via a M5 bolt. Remove Knobs un-screw selector switch. 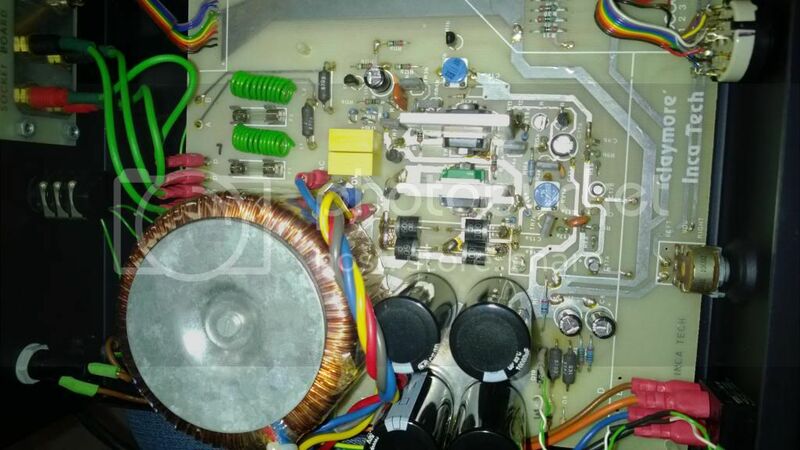 Slide PCB as whole to the back and lift when volume shaft is clear up from the front. Making sure it is OFF and un-pluged release four wire from ON/OFF switch. Before lifting PCB. Easy when you done one or two.
) cheers fella's , i have one of those , got the chassis in a vice and giving it a whack , is the board supposed to come out in eight pieces ? No use a Plastic Hammer the type that come in the plastic box and glue for trainee engineers and glue. I ended up with two of the 2 pole 6 way selectors as linked to above...e-bay and then christmas postage balls up..So I ordered a second. Hi Col, when changing FET's on the Claymore, is it advisable to change the plastic pads to ceramic pads? If so, where is the best place to get them, part numbers etc? Change them yes, the originals where MICA. SIL PADS are OK but not as good, Ceramic are best all from Farnell, RS and maybe Maplin for TO247 or TOP3P packages. Mark, what exactly do yo need to know.